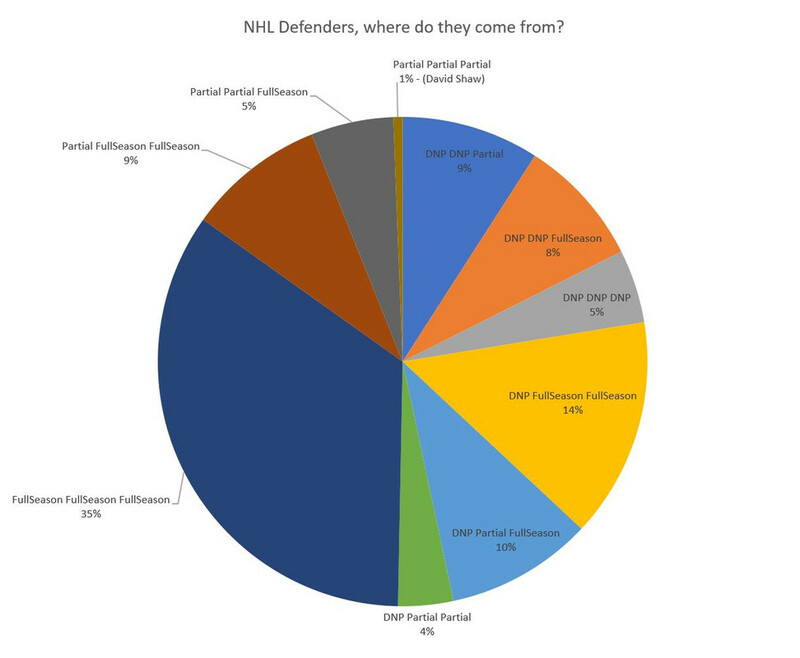 Defensemen, what is their path? There are 165 defenders who were drafte in the first round of the NHL entry draft who ended up playing 500 NHL games. 35% were basically full time NHL players right off the bat, playing a full season in their Draft+1 ("D+1") season. This encompasses everyone from Drew Doughty to Jim Benning. 14% Did not play in their D+1 but played a basically a full NHL season in their D+2. This includes everyone from Erik Karlsson to Michael del Zotto. 9% Played some games in their D+1 and then were basically full time after that. Examples are Scott Niedermayer and Rostislsav Klesla. 10% Did not play in their D+1, played some games in D+2, and were full-time by D+3 . Darryl Sydor, Karl Alzner. 5% Played a partial season in their D+1 and their D+2 and then were full-time D+3. Say hello, Alex Pietrangelo and Drake Berehowsky. 4% Skipped D1 and got just a partial season in both their D2 and D3. What else do Ken Daneyko and John Van Boxmeer have in common? 9% Did not play through D2 but played some of their D3. This is "Nick Boynton/Barret Jackman"
8% Did not play in either their D+1 or D+2 but got a full D+3. This is the Ryan Suter-Dion Phaneuf group. 5% of our players did not get any games through their D+3 and still made it to 500 NHL games. These are mostly NCAA guys and Jeff Beukeboom. Finally, there is one dude who got a partial season in all of his D1, D2 and D3. His name is David Shaw. While I have not yet evaluated forwards, it seems to me that the evidence supporting the wide-spread belief that "defensemen take longer" is pretty weak, as roughly 50% of the eventual successful players got at least 1 game in their D+1 and basically 70% of them got some games by their D+2. Here is a pie chart. NHL analysis from a potato.